For work, I've been traveling quite a bit to San Diego to work on a client project. By coincidence, the client's office is located right along San Diego's "Asian" strip. Along Convoy Street there are a host of Japanese, Korean, and Chinese restaurants. Probably some others like Vietnam as well. The first time I went I remember seeing a Japanese BBQ restaurant on the way to the client in the morning. But in the evening I could never find it again, not sure why. Well, on this last trip I was finally able to see it. This last trip I finally saw it again as we were headed over to the client. So at our lunch break I walked over to where I think I saw it. Turns out it was like a 5 minute walk from the client's offices. After heading back to the hotel after work, I googled the name and found the website, address and map. I also took a look at yelp to see what people had to say about it. I took the pictures with my cell phone which doesn't have the best camera. As you can see (for those of you whom have never been to a Japanese BBQ), you grill the meat yourself. 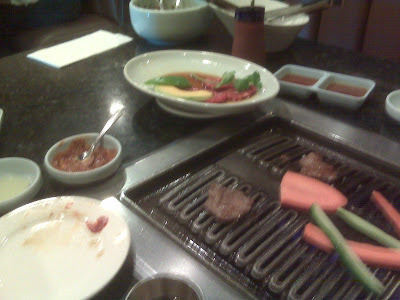 We had Kalbi, Ribeye and Tongue. We also had Bibimba which is rice and vegetable bowl that somes with a spicy miso sauce to mix in. Great stuff, although the sauce was only okay. The tongue was cut a little thicker than I remember from Japan, but still good. 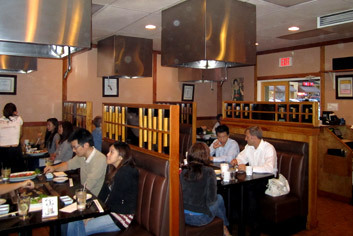 The following picture I stole from Tsuruhashi's website (without permission, I'll remove it if they ask) gives you a sense of what the restaurant looks like inside. Each table has a grill in the middle and large fans above for the smoke that comes off the grill. 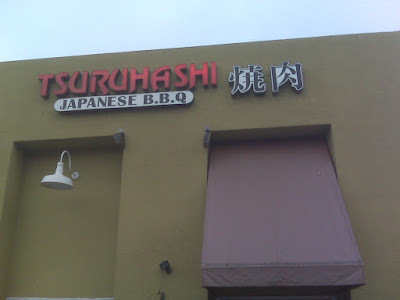 Remember, while it says "Japanese BBQ", it's basically the Japanese version of Korean BBQ. Earlier this year I went to a Korean BBQ that was authentic Korean and while it was good, I said at the time I like the Japanese version better. And I must admit that I do. I agree with some of the comments on Yelp where the dipping sauces weren't the best I've ever had, but they didn't detract from the overall taste. Man, this is my favorite meal. If you find yourself in the area, here's the address and phone number. And a map. My colleagues suggested that my wife and I open one in Cleveland. I'd love to do that. Anybody else think it's a good idea?